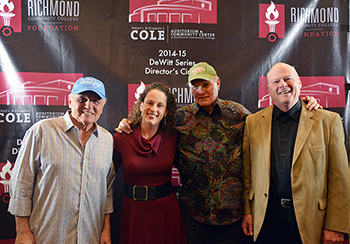 The DeWitt Performing Arts Series, which dates back to 1999, is funded through the Richmond Community College Foundation by funds donated from the family of the late Carrie B. DeWitt. The series was started as a way to showcase the capabilities of this state-of-the-art theatre and to make top-quality performances assessable and affordable to residents and visitors to the sandhills area of North Carolina. Each season the series features nationally-recognized touring performances representing a diverse range of genres starting in the fall of each year and concluding late in the spring. Season ticket sales begin in late summer. Individual show tickets are available until the night of each performances. 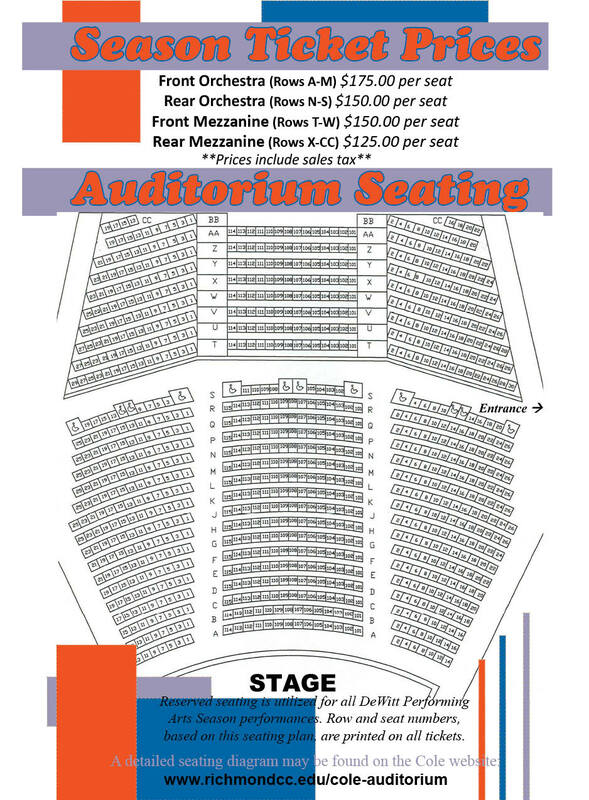 Admission and ticketing for all of the DeWitt Series performances are a reserved-seat basis based on this seating arrangement. For details about getting on the waiting list for season tickets for the 2018-2019 season, please contact the Cole Box Office at 910-410-1691 or e-mail us at coleaud@richmondcc.edu. Being on the waiting list gets your priority seating opportunities (with upgrade opportunities). Video links, photos, show descriptions, and much more information continually updated! Check back often. Thursday, March 21, 2019 - 7:30p.m. Thursday, April 11, 2019 - 7:30p.m. Monday, October 29, 2018 - 7:30p.m. Monday, November 26, 2018 - Special Start Time 7:00p.m. Tuesday, January 22, 2019 - 7:30p.m. Tuesday, February 5, 2019 - 7:30p.m. Season ticket prices range from $125 to $175 depending on the seating section (ask about prorated prices after the season starts!). All prices include all applicable sales taxes. All seats are reserved based on the seating chart. Contact the Cole Box Office for further information about purchasing season tickets. Individual show tickets are also available. Contact the Box Office and you will be placed on a call list to contacted when tickets for those individual shows go on sale. DeWitt Series patrons have the opportunity to join the Director's Circle, a program that supports the RCC Foundation. A Director's Circle upgrade rewards members with perks such as reserved parking and eligibility for priority seating upgrades. Members are treated to a wine and cheese reception before each DeWitt Series performance, including meet-and-greets with many of the performers and an End-of-Season Gala with a gourmet dinner on the stage of the Cole Auditorium! Because all revenues support the RCC Foundation, dues are tax deductible. For more information about the Director's Circle, contact Cole Auditorium Director Joey Bennett at (910) 410-1691.